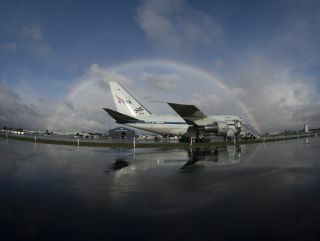 NASA's SOFIA flying observatory is framed by a rainbow following a shower as it sits on a ramp at Christchurch International Airport, New Zealand during its first Southern Hemisphere deployment. This image was released July 18, 2013. NASA has begun looking for outside funding to keep its flying astronomical observatory aloft. The space agency issued a request for information on Monday (March 31) in an attempt to find partners who wish to use the Stratospheric Observatory for Infrared Astronomy (SOFIA), a modified Boeing 747 jet that scans the heavens using an 8.2-foot-wide (2.5 meters) telescope. The White House's 2015 federal budget request, which was released last month, slashed funding for SOFIA. NASA officials have said the observatory will have to be placed in storage at the end of this fiscal year (Sept. 30) unless an infusion of cash from outside sources can be secured. "Various partnership levels will be considered. Partnerships can range from joining as a major partner to securing flights on a night-by-night basis," NASA officials wrote in a press release Tuesday (April 1) describing the SOFIA request for information. "Due to the current budget situation, partnership arrangements would be initiated immediately in order to be in place prior to Oct. 1," they added. "Potential partners are invited to submit their interest or questions in writing as soon as possible, but prior to May 1." NASA will also hold an "industry day" on April 11 at the agency's Flight Research Center in Palmdale, Calif., where the aircraft is based, to discuss opportunities with potential partners, officials said. NASA already partners with one outside organization on SOFIA — the German Aerospace Center, whose German acronym is DLR. In fact, Germany provided the observatory's 19-ton telescope and bears 20 percent of the project's annual operating costs, according to DLR's SOFIA website. SOFIA is optimized to view in infrared wavelengths. During its 10-hour science flights, which began in 2010, the observatory cruises at an altitude of 41,000 to 45,000 feet (12,500 to 13,700 m), getting above 99 percent of the infrared-absorbing water vapor in Earth's atmosphere. The plane is also able to chase down one-off cosmic events, such as the June 2011 occultation of a star by Pluto, which was visible only from a small patch over the Pacific Ocean. And SOFIA is adaptable, featuring the ability to change science instruments between flights, NASA officials said. SOFIA's development costs totaled about $1 billion, and it costs $87 million to operate the observatory every year, officials have said.